Over the past few years, office partitions have become a popular trend in the office fit out and design industry, and are continuing to grow in popularity in offices all over the world. More than ever before, having a well designed office is of the utmost importance to most companies. It doesn’t matter what sector of business you’re in, an office acts as a centralised hub for the whole organisation and its’ appearance is importance. Whether you work in engineering or graphic design, good company image is crucial and bringing that to life in your office environment as well as all other aspects of the company is essential. The great thing about the office fit out and design industry is that no two offices are the same. We’ve all seen those “Coolest Offices in the World” type articles, and it just proves that there’s a world of design ideas out there just waiting to take over your office. Believe it or not, office refurbishment and design can be just as exciting as interior design for your home – and, if anything – you have even more room to play around with designs and interior features. Of course, there’s no point in having a stylish office which isn’t quite practical enough. Office filled with quirky gadgets and chill out zones might look impressive, but if there’s no room left to work efficiently and get the job done well – it’s not serving its purpose as an office. Some of the most essential features of modern offices are co-working spaces, private meeting rooms and of course, singular desk spaces. If you’ve only got an open plan space to work with – then how is it possible to be able to provide both noisy co-working spaces with areas that require privacy all in one room? Well, without undergoing any major building work and restructuring the office entirely, why not invest in some office partitions? Office partitions are the quickest, easiest and most cost effective way of creating a more productive work space. Office partitions can be temporary or permanent, and can fit into just about any size room required. Think of office partitions of putting up a temporary wall which isn’t actually a wall, and wouldn’t make half as much noise or mess to erect than a solid structure. They are available in many different styles – from glass partitions to timber and wood partitions depending on the look and finish you require. Perfect for any working environment, wood or timber partitions can be used to bring a more traditional look into the office, whilst creating a sense of warmth and classiness. They have been a favourite for years in the office fit out and design industry, as they easily fit into the design of any office while giving a natural feel. 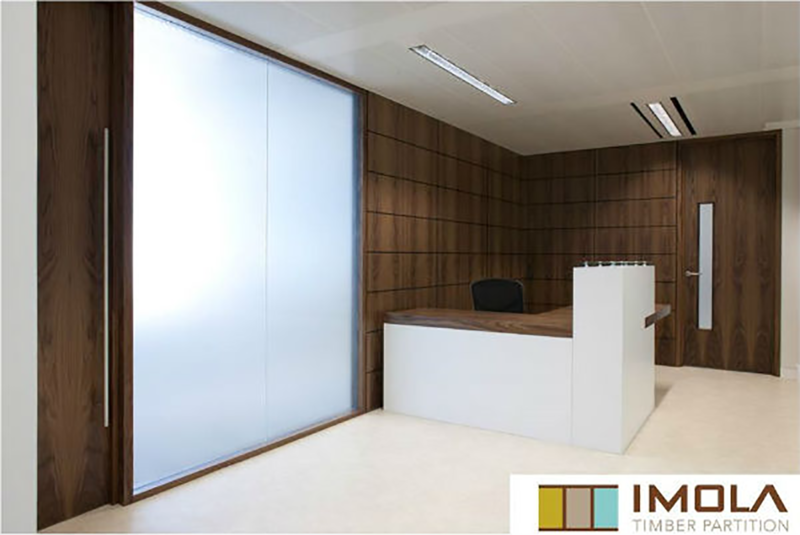 Timber partitioning systems are available in a variety of different finishes such as solid wood or veneer finished MDF, depending on the finish you’re looking for. Non-load bearing timber partitions come with timber faced trims, glazing sections, door frames and skirting, making them easy to demount and relocate to any other position in the office. They can look at-home just about anywhere; from reception areas to boardrooms and conference rooms, or the general office environment. With plenty of popular wood options to choose from such as oak, beech, maple, cherry and many more, there’s a finish that can fit into any office design. 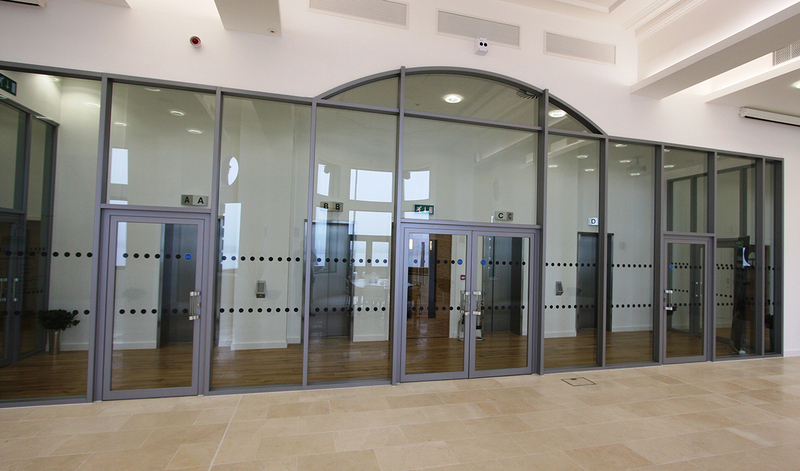 The great thing about timber partitioning systems is that they’re not restricted to full wood, solid partitions and can also be combined with glazing to give a brighter feel to a room. These systems are also great for creating soundproof environments, with solid systems able to provide a soundproof rating of up to 52 dB (Rw), and those with glazing included reaching 40 dB (Rw). One of the biggest concerns in office and commercial environments is fire safety, and it’s important that your building is compliant with strict building regulations. This is where fire proof office partitions are a necessity, as they can help to contain a fire to one area and limit the spread of flames, smoke and toxic gases. Solid timber partitions can provide a fire rating of up to 60 minutes, while those combined with either single or double glazed elements stand at around 57 minutes. Aluminium partitions prove to be one of the most durable partitioning systems available, although still provide great flexibility with installing, demounting and relocating when needed. They are available in solid units, with part or full glazing and are quick and easy to install with minimal disruption. All aluminium frames can be powder coated to suit your requirements, and joints can be covered with aluminium cover trims or taped & filled to give a flush wall finish if required. The great thing about aluminium partitions is the variety of finishes and styles available, and they are particular popular when paired with integral blinds in the cavity to provide a sleek and stylish alternative to regular window blinds with great functionality and purpose to increase privacy. Solid aluminium partitioning systems provide sound reduction ratings of up to 52 dB (Rw), while those with glazing offer up to dB (Rw). Fire ratings of aluminium partitions provide a maximum of 60 minutes in both solid panels and those with glazing. Although it’s important to indicate that fire protection is required when ordering, so that the appropriate insulation, fire rated glass and certificates can be provided to deem them fire safe. 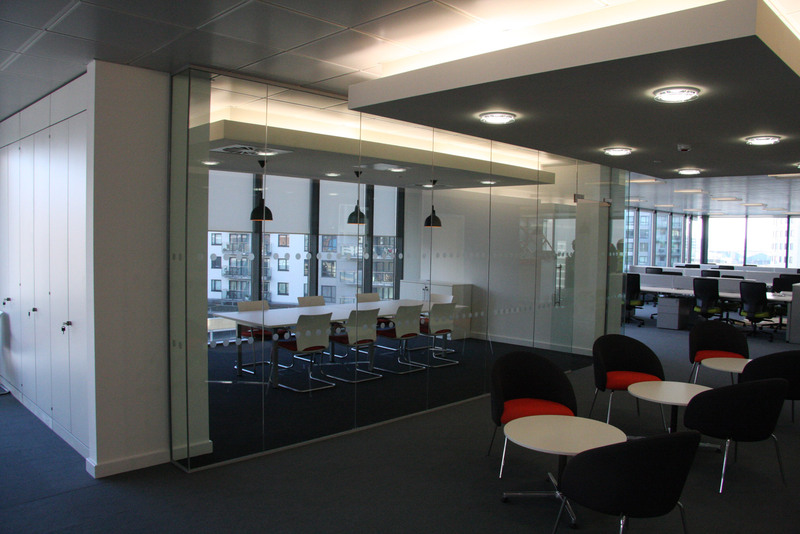 We might be biased here at Office Blinds & Glazing, but we think glass partitions are the best choice for modern offices. It’s a common theme now that offices and corporate buildings opt to incorporate more glass features into their workspaces for that modern touch. Skyscraper buildings with glass fronted offices are a desirable space to set up office for many companies for many different reasons. There’s no doubt about the fact that they look aesthetically pleasing and impressive to potential customers, giving off the impression of a well established company with a good image. However, it’s not always viable to relocate your company to another building, which is why glass partitions are a great way to spruce up your office space without exceeding your budget. Unlike many other alternative partition systems, glazing can be designed just the way you want it. With modern technology, you can achieve many different looks with frosting or printing to add unique styles and designs to your glazing. It’s a popular choice of many organisations to have their logos or key colours branded onto their partitions, to really tie in with their office design and bring the whole look together. One of the great benefits of glass partitions is their ability to make the most of natural lighting. Nobody wants to work in a dull and dark environment, and with the introduction of more glazing, you can transform your workspace into a brighter, more energetic place. Artificial lighting can only do so much for a small space, so it’s a great idea to enhance this with the introduction of as much natural lighting as possible. Solid walls and partitions are only going to darken an area, and will most probably result in the added cost of needing to install even more artificial lighting. Did you know, you can also get fire rated glass partitions? When it comes to fire safety in the office, fire rated glass partitions and doors can provide up to a maximum of 120 minutes protection from heat, flames and gas up to a temperature of 1600°F, compared to standard glazing which would shatter under temperatures of around 250°F. Find out more about fire rated screens & doors here. Glass partitioning systems are available with frameless full height glazing for a smooth and sleek finish, or with solid aluminium frames. We’ve designed, created and installed a great variety of glass partitions throughout the UK, some with unique styles and designs and others with curved shapes for a sleek and elegant finish. You can view some of our work in our gallery. 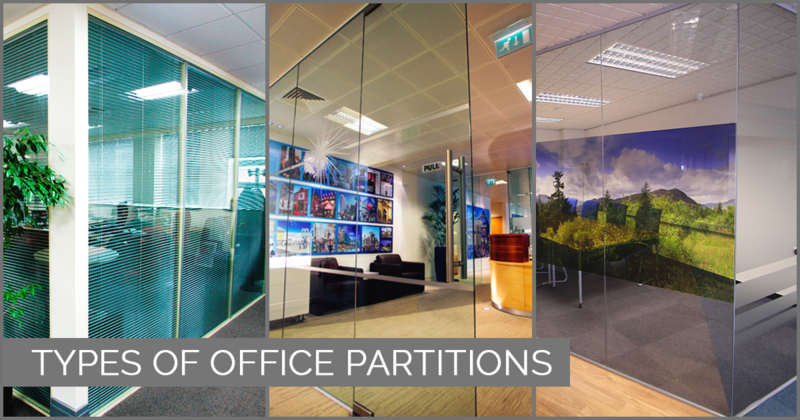 Read more: Why choose glass office partitions for your business? Cost-effective: There’s no doubt about the fact that office partitions are much more cost effective than trying to divide an office using solid, permanent walls. Depending on the level of quality and design you require from your office partition, they can be a fairly inexpensive investment to the office, but one that can completely change the productivity and efficiency of the office. Practical: Who wants to commit to building a solid partition wall in the centre of the office and dividing it in half for the foreseeable future? Businesses change all of the time; the way they work, the amount of employees and sizes of departments are subject to change at any time. With office partitions, you have the ability to have them quickly installed and removed or relocated whenever you want, with minimal mess. This prevents you from being limited by your current space and the way the office has been arranged. Privacy: One of the biggest influencing factors of companies investing in partitioning systems is to be able to section off more private spaces. We all know what it’s like to have to try and locate a private area for meeting that you don’t want any one to overhear, when you’re stuck in an open plan office and space is limited. With the possibility of now being able to get temporary or permanent soundproof office partitions, this is no longer an issue. Light: This benefit is directed mostly towards glass partitions, or even those with small glazed windows or pieces incorporated in the design. 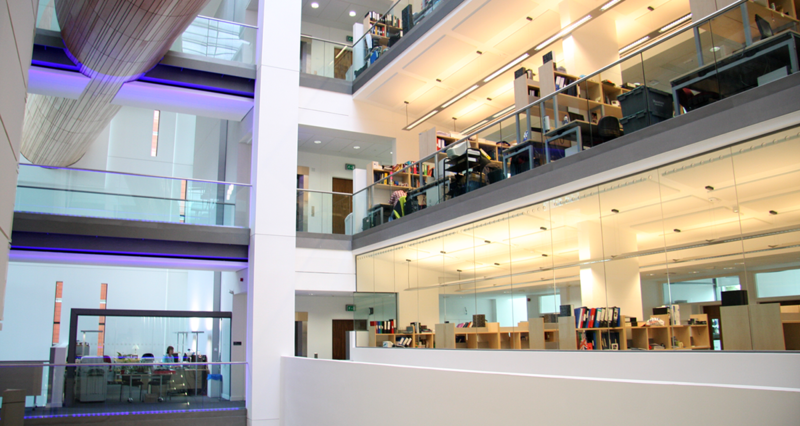 As opposed to building solid walls or adding timber dividing doors, incorporating more glazing into the design of an office can allow much more light to pass through – making for a brighter, more airy environment. Natural lighting has been proven to increase morale of employees, which in turn has a positive effect on productivity in the workplace. It sounds like a win, win! We don’t need to try to convince you that office partitions are the ideal addition to your office, so if you’re interested in getting a quote for supply & installation today, get in touch or have a chat with us online to discuss your options.